This is a brand new stereo microscope with color USB digital image system that captures microscope images and displays them on your PC screen. The USB digital camera offers 640x480 resolution and is compatible with Windows XP/Vista/7. With the user friendly software included, you can edit microscope images in the same way as you use PhotoShop. You can record videos, capture still images, and save them in BMP, TIFF, JPG, PICT, PTL and other formats. You can also conduct length, angle, area and other measurements across images. It has a built-in reduction lens and gives the same field of view images on your PC screen as those seen through eyepieces. The microscope comes with four magnification settings (5X, 10X, 15X & 30X), a three-position switch and top/bottom halogen illuminating system. It meets all the requirements of text books up to high school. This stereomicroscopy system is an ideal instrument for students and hobbyists to view insects, plants, rocks, stamps, coins, jewel and etc. It is a perfect microscope for home school or family applications. Its retail value is above $900. 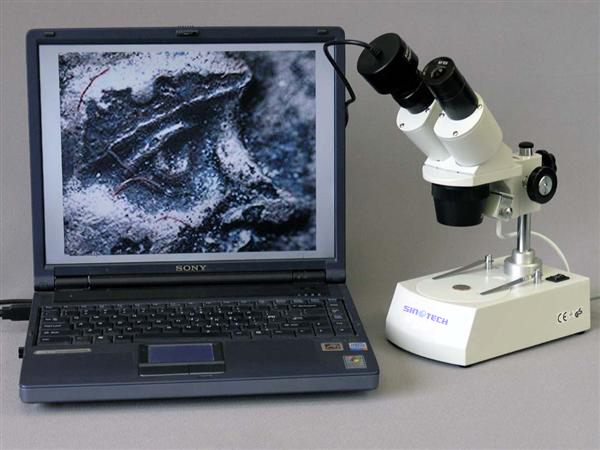 An affordable great stereo microscope with digital image system! User friendly software compatible with XP/Vista/7. Edits microscope images in the same way as you use PhotoShop. Captures microscope still images, records live videos, and saves images in BMP, TIFF, JPG, PICT, PTL and other formats. Conducts length, angle, area and other measurements across images. 0.5X reduction lens built-in already! Four magnification levels: 5X, 10X, 15X & 30X. Widefield Eyepiece: WF5X and WF10X. News | Products | About us Zhangzhou Sino Science & Technology Co., Ltd.